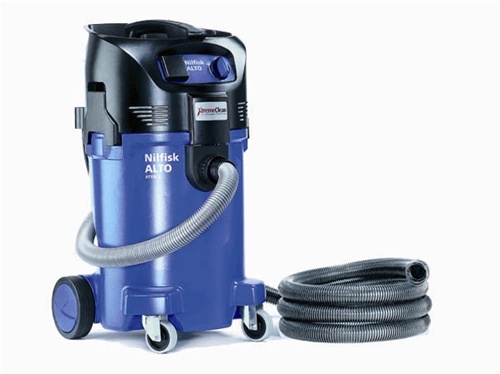 Attix vacuums, designed with German Wap/Alto technology, are one generation beyond the SQ or Turbo vacs. Click here for video demonstration of XtremeClean Filter picking up a 50 lb. bag of Portland Cement mix with no bag inside vacuum. ** AutoStart-Electric feature. Plug in an electric tool (sander, saw, etc.) into the vacuum, and the vac automatically starts up when you start the tool. Click HERE to compare Attix 50 series (12 gallon) models. Provides filtration to 99.99% at 0.3 microns, meeting EPA Renovation, Repair and Painting Rule (RRP) standards for HEPA filtration HEPA filter designed for DRY use only. XtremeClean self cleaning filter -- cleans itself as you work. See online video demonstration of this filter at work. Click on above photo for picture demonstration of filter. Other accessories available. They can be purchased through the Parts and Accessories menu on this web site.